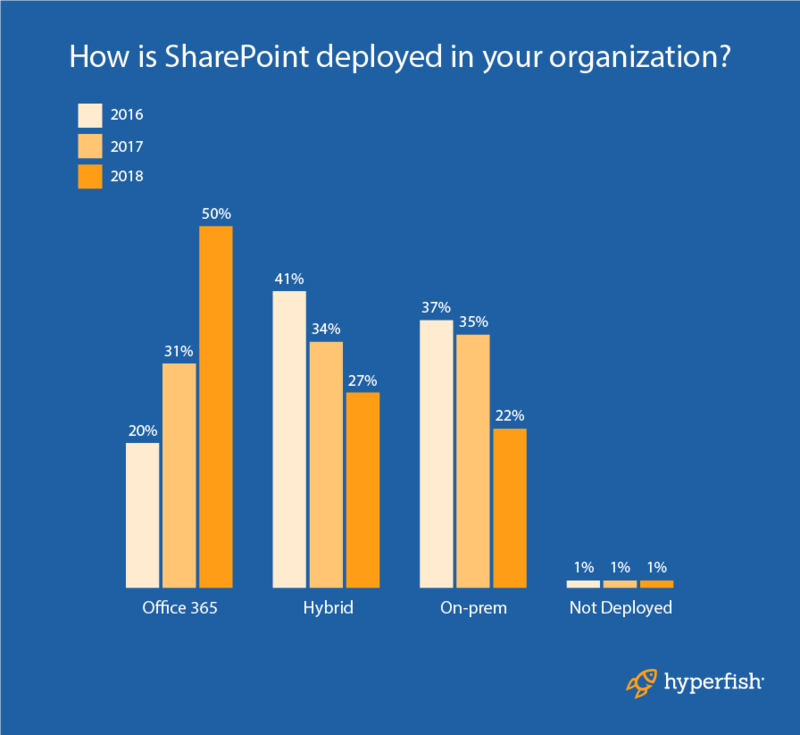 The Global SharePoint and Office 365 survey, conducted by Hyperfish, Sharegate, Nintex, and LiveTiles, has returned for its third year. Each year, we survey hundreds of businesses operating on SharePoint and Office 365 to see the progress the platforms have made over the year and debate what the future holds for them. It won’t come as much of a surprise that cloud-based SharePoint usage is at an all-time high. Our 2018 survey results reveal that adoption of SharePoint Online in Office 365 has jumped from 31% in 2017 to 50% in 2018. Despite the leap in adoption, however, some companies still resist migrating to SharePoint and Office 365, many citing security concerns as the main reason preventing them. Over the coming series of blogs, we’ll be analyzing the results of the survey. This blog focuses on SharePoint Online adoption and the factors that contribute to its continued rise in popularity. When the results were unveiled this time last year, we were impressed that the number of SharePoint Online users had risen from 20% to 31%. 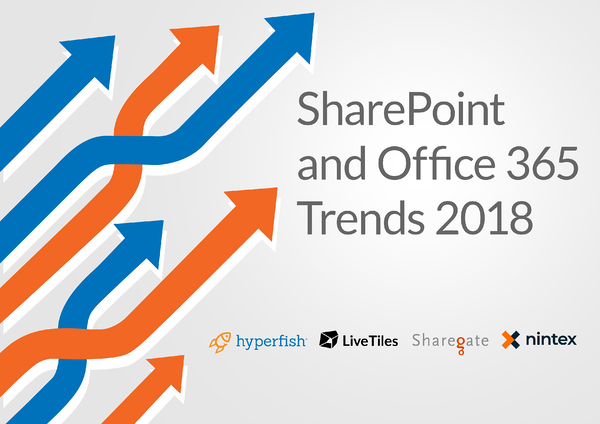 This trend has only continued into 2018 – now, 50% of businesses use SharePoint Online in some form. 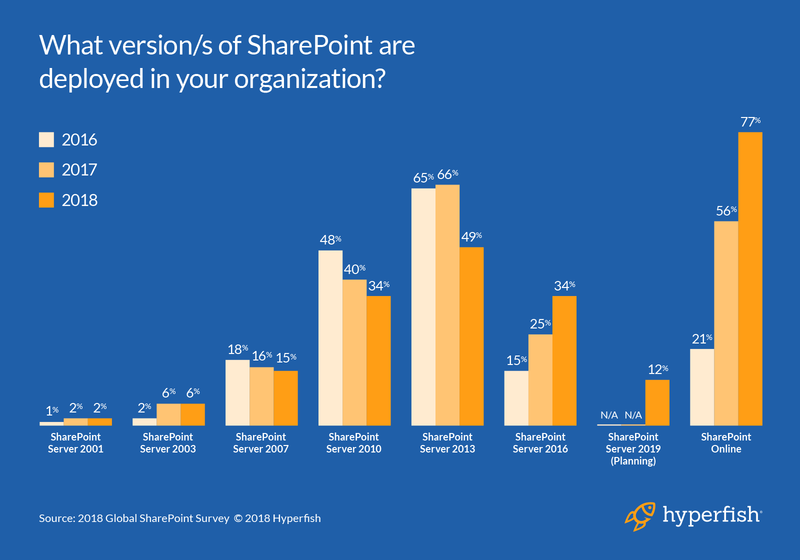 In line with the move to the cloud and Office 365, the use of hybrid and on-premises SharePoint use has significantly decreased. These were used by 34% and 35% of organizations respectively in 2017, reducing to 27% and 22% in 2018. This follows a trend across the world of business technology. Cloud computing has become the default option. In fact, during the fourth quarter of 2017, Microsoft’s Office 365 revenues surpassed those of traditional licensing for the first time. As far as Microsoft and its users are concerned, the cloud has become the new normal. Public cloud platforms like Azure feature some of the world’s most sophisticated cyber-security protections. In order to be trusted with the world’s data, vendors like Microsoft, Amazon, and Google must invest in cutting-edge cloud security technology. Yet security remains one of the main reasons why companies remain hesitant to move to the cloud. The latest AI and machine learning systems have been implemented in Microsoft Azure to create a watertight cyber security network. Features like the Azure Key Vault and Azure Rights Management use cutting edge technology to make your permission management and identity protection systems much safer than any on-premises alternative. In what was one of the biggest surprises of our research, security concerns significantly grew as the main obstacle to migration. In 2018, a full 50% of businesses reported security as their main migration obstacle, compared with 36% in 2017 and 32% in 2016. ‘Control concerns’ also rose to the third most important factor at 27%. Whatever the reason, it’s clear that security is still a considerable obstacle for companies considering a cloud migration. SharePoint 2013 remains the most popular on-premises alternative for those who haven’t migrated to the cloud – but by a lesser degree than last year. In 2017, a total of 66% of users deployed SharePoint 2013, compared with 49% using it this year. SharePoint Server 2016 remains slightly behind with 34% of users. Despite that, it’s the only on-premises version of SharePoint to have increased in usage since 2017, rising from 25%. On the other end of the spectrum, it’s interesting to note that 2% of companies still use SharePoint 2001, and 6% use SharePoint 2003, despite Microsoft discontinuing support for these platforms. 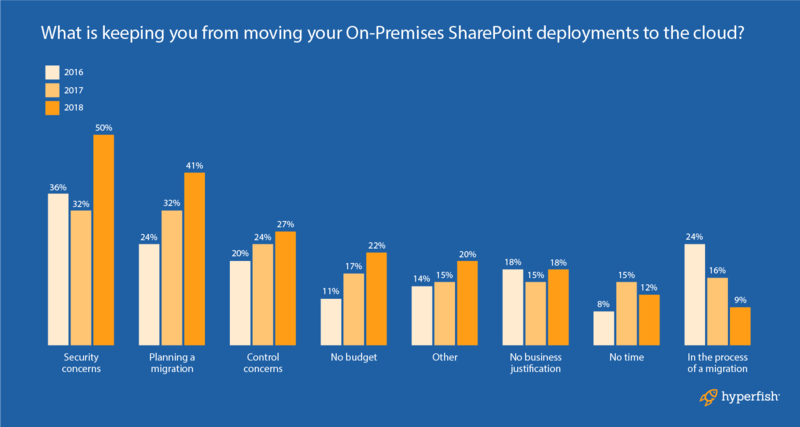 An exciting result was 12% of respondents indicated they are already preparing to use SharePoint Server 2019, which was released just a few weeks ago. Perhaps the most interesting conclusion we can draw from this is the number of companies that anticipate continuing to operate on-premises platforms while most organizations migrate parts or all of their business to the cloud. As we move into 2019, we may well find that the remaining 50% of companies prove more reluctant to move than the first half. But as digital transformation continues, and on-premises releases become more and more outdated, it will become increasingly difficult for companies to continue maintaining these legacy platforms. Microsoft is still making on-premises SharePoint and hybrid cloud environments a priority for the near future, providing for businesses that remained committed to working on-premises. Softening or removing cloud security fears and continuing to prove the many benefits of cloud computing over the next few years will be crucial in 2019. Our wide ranging report discovered plenty of fascinating facts about SharePoint usage in 2018, which will be covered in the remaining three blogs of the series. Click here to find out more about the rise of Microsoft Teams. To learn more about Hyperfish and how we help organizations bring their company directory to life, get in touch or try Hyperfish Lite for free today and automate the collection and management of your Office 365 profile photos.